 Start earning what you’re really worth. And fund the life you really want. You’ve probably heard a friend complain, “That’s just the way freelancing goes.” Every time the two of you catch up over lunch, he shares yet another egregious example of a difficult client or low-paying project. I’d like to call bulls**t on that right now. You’ve got to wonder: If the only common element in all those horror stories is your friend Mr. Grumpy Pants, then who or what is the root of the problem? Sure, some freelancers, creatives, and consultants get stuck on the feast-or-famine rollercoaster. They *seem* to have terrible luck. Yet, at the same time, others prosper. They step off the roller coaster and never look back. I’d like for you to join the second group. Earn What You’re Worth guides you through a clear, step-by-step process for raising your rates and reverse engineering your desired lifestyle. It’s not really about the money, is it? It’s about lifestyle. You’ve got to use what’s on the other side of the money to determine what you charge. To build a sustainable business, you’ve got to have a clear vision for what you’ll do with surplus profits. Maybe you plan to stay solo. Maybe you want to transition into consulting. Regardless, you can use EWYW to increase your own capacity to flourish and to give back. The guide will take you through a series of brief exercises and help you zero in on your financial and lifestyle goals. $9.99 – The BASIC package gets you the book. What is your true effectiveness? Factor in vacation time. Duh. When I first met Stuart, he felt stuck. He knew he was smart and had tons of talent. He’d made videos for well-known brands like Red Bull, and his work had enabled a handful of clients to win awards and sponsorships. But Stuart wasn’t making the kind of money he wanted to make. He was stuck in what we’ll call the “Pricing Labyrinth.” Even though he was slowly figuring out the business side of things through trial and error, he wanted to move faster. He wanted to escape the labyrinth sooner rather than later. Guess what? Stuart used a few of the EWYW strategies to set new rates, and that same day, he sold at huge project at $50 more per hour than he had been charging. 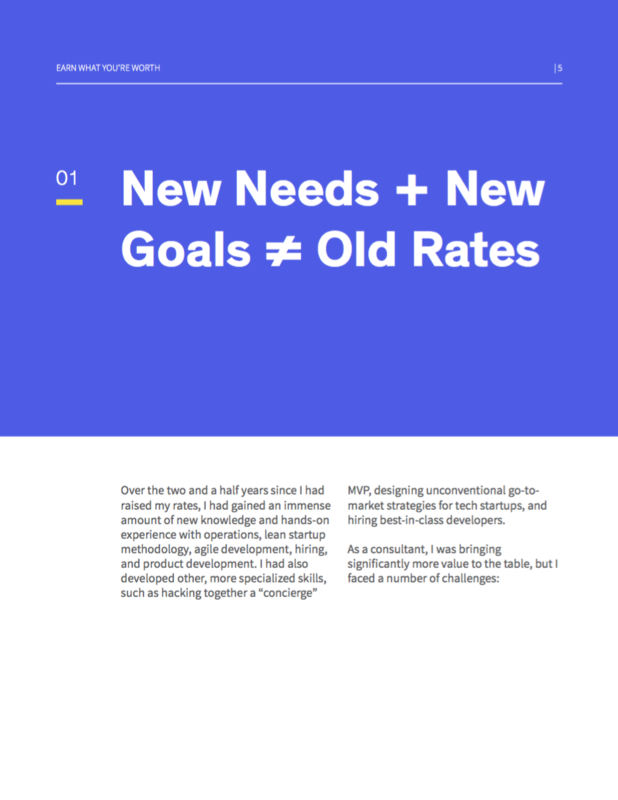 When I rebooted my consultancy Wunderbar, I wanted a straightforward process for setting new rates. I already knew about cost-plus pricing, which is how a car repair might charge—$75 for an hour of labor and $78 for the new head gasket. I had already been down the competitive model path, and I was already on the expensive side for the Knoxville, Tennessee, market. 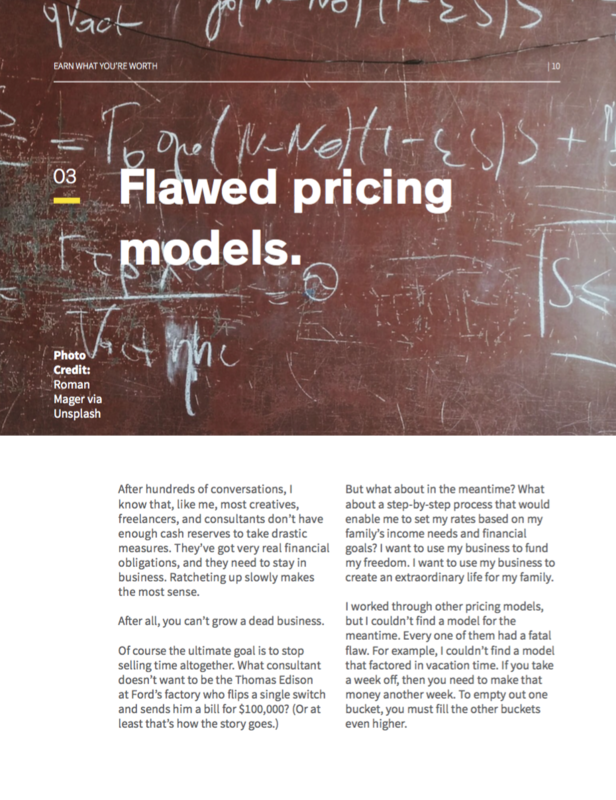 I had sold projects with value-based pricing. I was confident that I could produce a clear return on investment, and that my involvement would pay for itself. 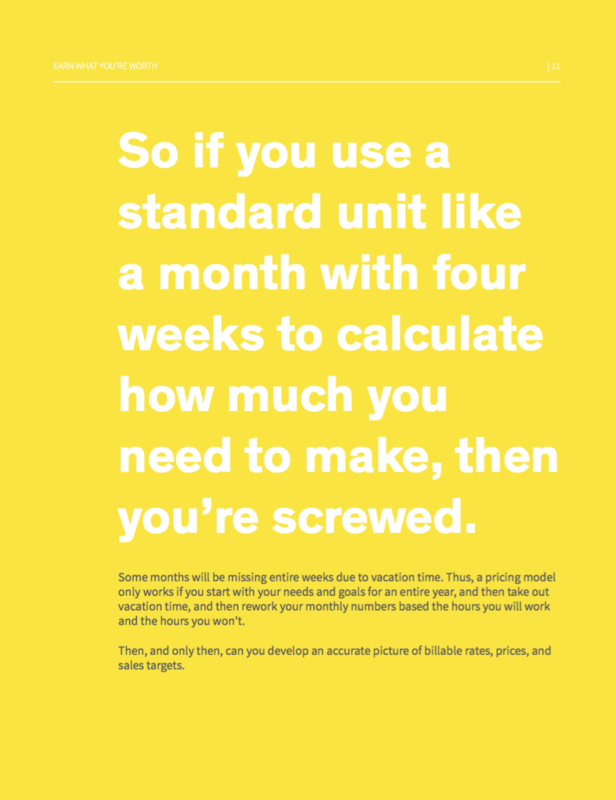 This is a great model, but attracting clients who get the value-based model takes time. What about a step-by-step process that would enable me to set my rates based on my family’s income needs and financial goals? After hundreds of conversations with people like Stuart, I know that most creatives have very real financial obligations. They need to stay in business while they ratchet up their rates. For example, take Greg. He does work for a number of non-profits, and he really enjoys most of his clients. He wanted to be careful to not price himself out of range of his most loyal clients halfway through a project. So he used his new EWYW rates to double the price on a small design project. After his client said yes in thirty seconds, he realized he had been leaving money on the table. 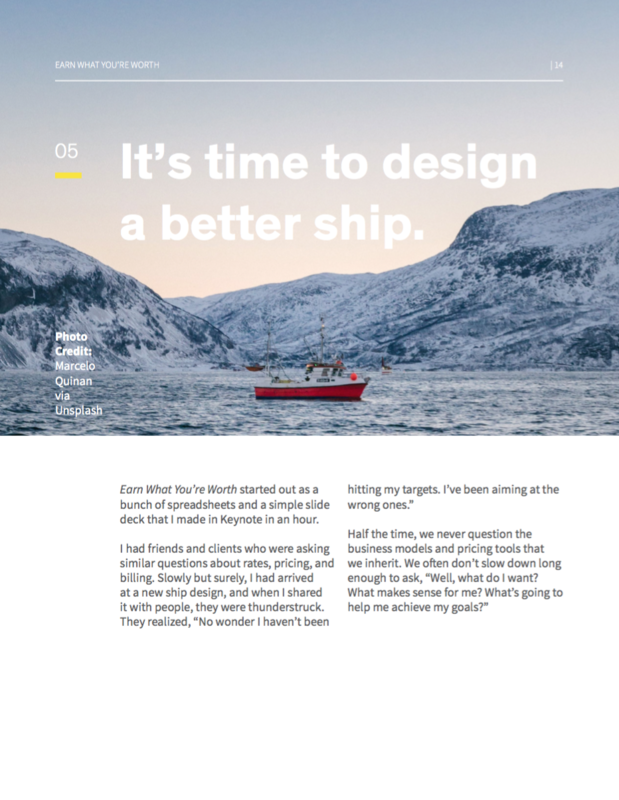 EWYW works because it starts with your projected needs and goals for an entire year. Once you exclude vacation time, you rework your monthly numbers based the hours you will work and the hours you won’t. Then, and only then, can you develop an accurate picture of billable rates, prices, and sales targets. Once you are very, very clear on what you want, how much money you need to live, and how much money you will need to fund your ideal lifestyle, you can define “success” for yourself. You can begin working toward that ideal and making the kind of money you’ve always dreamed about. Earn What You’re Worth works right now, with your real life, with the business you already have, no matter what state it is in. It’s not theoretical mumbo-jumbo that you keep on file just in case. Put your numbers into the spreadsheets. This isn’t brain surgery or rocket science, people. 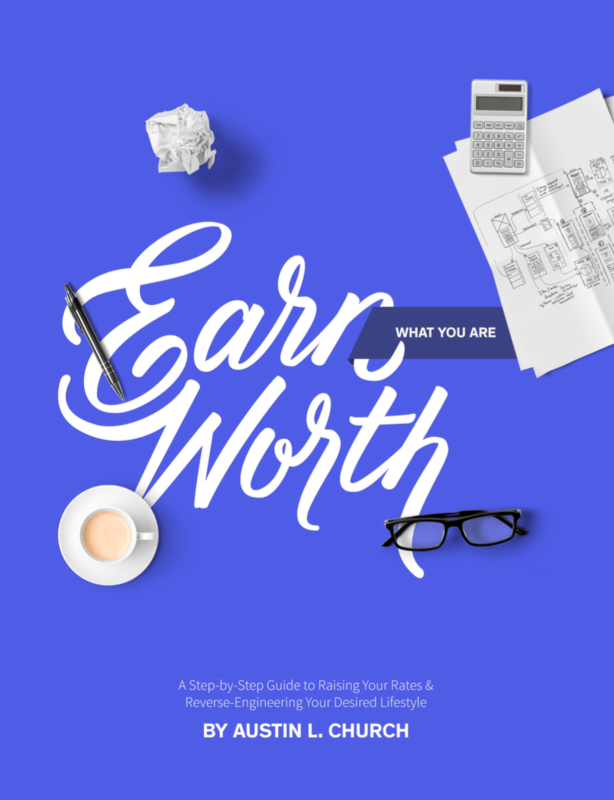 Earn What You’re Worth is a step-by-step guide to raising your rates and reverse engineering your desired lifestyle. The only thing left is for you to get started. I genuinely hope that this year is your best year ever. P.S. I should mention that I’m happy to answer any questions you might have. I believe 100% in the EWYW process. But you may still want to talk to a real person if you’re unsure about a certain step. It’s easy for me and for all of us to forget what it’s like to not know what we know. Send me an email at admin@austinlchurch.com, and I’ll do my very best to respond within 48 hours (weekends excluded, of course).